Do you like the look of brightly lit night sky covered with the sparkling stars? 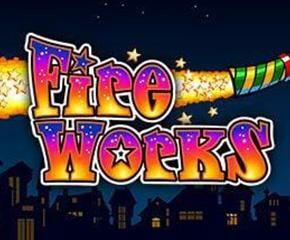 If yes, then be prepared to fall in love with this beautifully designed slot game Fireworks. This is 5 reels and 10 payline simple gameplay slot. It has some vibrant colours that complement its name. The background music and peppy graphics make this slot lively. Fireworks slots have been designed by Realistic Games, the software developers that are famous for creating some of the best slot games in the industry. Fireworks slots is set against the backdrop of a city with a building that has lights peeking through the window. The night sky is filled with stars and a brightly coloured rocket is passing through the screen with the slot logo written on it. The reels are transparent, and the symbols appear to be floating on the screen. These include seven, golden bars, red, blue and white gems and a pile of cash. The highest paying symbol is the rocket that when appears 5 times on the reel can give you a multiplier of 5000x your stake. The best part about this slot is that a win can be made from left to right as well as right to left on the active paylines. The 10 paylines are fixed however the bet size can be adjusted accordingly. The bet ranges from 20p to £100 per spin. There are no special or bonus symbols in the slot game. There is a fuse under the reels that is connected to the rockets. To light the fuse, you need to land matching symbols on each of the reels. Once this happens and the fuse reaches to the rocket, the feature will get activated. Now the Bonus button will get activated. Choose one of the reels and that will stick to the slot whereas all the other reels will re-spin. There is a guaranteed win with every re-spin since one of the matching symbols will appear on them. 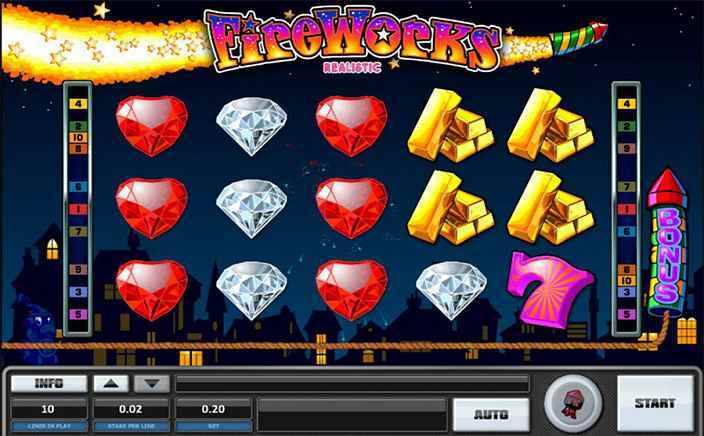 Fireworks slots is one fiery and exciting game. The graphics of this amazing slot are impeccable. The sound effects and an extremely smooth gameplay totally make up for the lack of any bonus symbols. The bonus feature is what gives this slot an extra oomph. The slot has an RTP of 95.15% and is accessible to all kinds of media devices like mobiles, laptops and tablets. Go on, give it a try!